« Falling for You Climbed to #4!!! And a new Excerpt! MJ Schiller is a fellow Crimson Romance author. I think she’s pretty awesome and her book sounds fantastic. So without chattering on from me, here’s MJ!! Heather was sweet enough to have me on her blog today and then left it up to me as to what I should write about. When I’m not enveloped in a world of my own creating, I’m shoveling out grub as a lunch lady at an elementary school. I have a seventeen-year-old, and three fifteen-year-olds. That’s right, triplets! They all have their learning permits and their birthdays, all four of my kids, actually, are looming on the horizon in mid-October. When I’ve had a hectic day with the kids, or at work, I like to unwind by singing karaoke. On any given night you can catch me belting out Evanescence or Adele at one of our local establishments, or maybe even some Nickelback. 1) People who see that everyone else is merging, but they figure it’s okay for them to zoom ahead, and then expect to be let in the line. Grrrr! 2) Capthca letters, they drive me crazy! Especially now that I’m a little older and can’t make them out nearly as well. 5) Folded clothes in the dirty laundry. You know your kids didn’t even wear them; they’re still folded! At least make an effort to rumple them up first! 6) Wrappers on the floor by trashcans. Like you didn’t know you missed. Bend over and pick it up! 8) When something is leaking and you get that drop of water that hits you right on the square of your head. It always feels disproportionally large. 9) When you pass up a decent spot to get a better spot and then go to pull into the parking space and it has one of those cart corrals in it! 1) Finding the magical configuration that allows you to squeeze that one last dish into the dishwasher. Makes me all warm and fuzzy! 4) Warm clothes, fresh from the dryer. 5) Catching the people on my exercise video messing up. (Look! She did it again this time!) I know, kind of pathetic. 8) Starbuck’s Peppermint Hot Chocolate, or for that matter, anything of a chocolate nature. 9) Hearing that “Weowombaway” song. (“The Lion Sleeps Tonight” by The Tokens). Don’t you just love that song?! 10) Crunching that one kind of thin bark that you see on sidewalks (add to this those helicopter thingies)! Okay- that’s probably about all you need to know about M.J. Schiller. 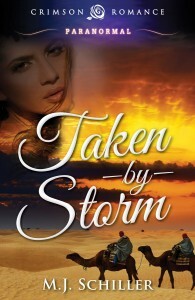 Taken by Storm begins as the darkly bitter Grand Vizier, Lord Boltar, is about to claim what he believes belongs to him, the rule of Avistad. The King of Avistad’s son, Prince Tahj, has just returned from a trip and senses the unrest even before his best friend and captain, Radeem, warns him. Radeem has heard rumors and suspects that the King’s advisor is planning to overthrow the crown. Just as Tahj discovers a “gift” from Lord Boltar, a young girl bound and gagged on the prince’s bedroom floor, fighting erupts. Tahj, Radeem, and the captive girl, Bashea, escape the castle in a hail of arrows. Born from the fire of a coup, Tahj and Bashea’s relationship burns with a passion that neither of them quite understands. 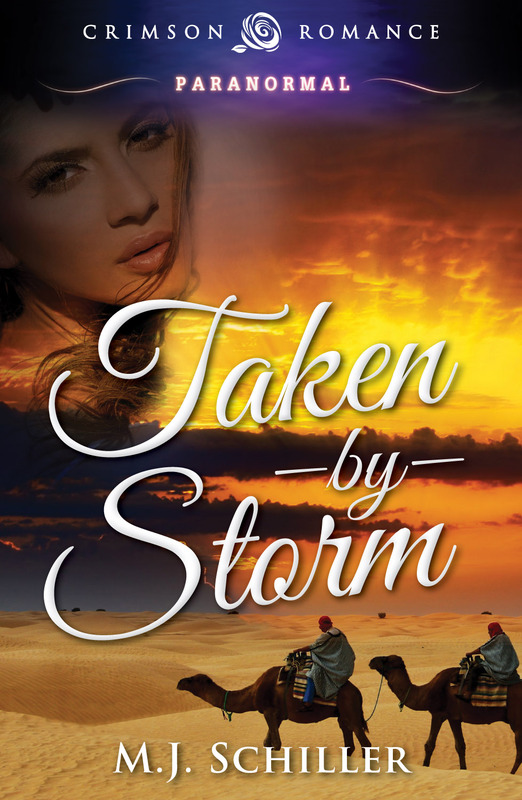 The pair is drawn closer together as they face various perils, Boltar’s soldiers, a screaming panther, even the scathing winds of a desert storm. But after what she had been through at the hands of Boltar’s men, Bashea is afraid to trust and her fiery nature is both what appeals to Tahj, and what drives him crazy. In fact, when Bashea’s brother, Bagrat, informs Tahj that Bashea means “lips of the gods,” he retorts, “Are you sure you don’t mean tongue of the devil?” It takes a long separation to bring them back to each other, but when Tahj does return, it is once again during a battle with Lord Boltar. But now the overlord, who has been forced beyond reason by Tahj’s success in retaking the throne, is an even more dangerous threat than before. Reunited, will Tahj and Bashea be strong enough to defeat their twisted and powerful enemy? Buy it today at Amazon.com, BN.com, and other E-book Retailers! And come visit me at www.mjschiller.com. Or find me on Facebook, Twitter, Goodreads, or Pinterest. So, what are some of your pet peeves? What are some of the things that make you unreasonably happy? Thanks so much for being here today MJ! Thank you for having me, Heather!